Keys to reducing accidents are education, proper selection, and proper use of equipment. A vast number of those in the construction industry use scaffolding on a daily basis. According to OSHA, nearly 65 percent of workers in the construction industry work on scaffolds frequently. From steel erectors to building equipment installers, bricklayers, window washers, carpenters, and painters, just to name a few, nearly 2.3 million construction workers frequently work on scaffolds. Construction sites are inherently unstable environments, with movement of workers, materials, etc. and changing landscapes. In 2004, approximately 400,000 workers suffered construction-site injuries. The Bureau of Labor Statistics revealed in 1996 that 25 percent of workers injured in scaffold accidents had received no scaffold training. With the high potential for serious injury, construction safety education remains a top priority. • Supported scaffolds, which consist of one or more platforms supported by rigid, load-bearing members, such as poles, legs, frames, outriggers, etc. Common types of supported scaffolds are frame, system, mobile (rolling), etc. • Suspended scaffolds, which are one or more platforms suspended by ropes or other non-rigid, overhead support. Suspended scaffolds are often used when washing windows or to access bridges and other structures when overhead support is the best option. • Other scaffolds, principally man lifts, cherry pickers, scissor lifts, etc., are sometimes thought of as vehicles or machinery but can be regarded as another type of supported scaffold. • Prior to use, inspect the scaffold to ensure it has not been altered and is in safe working condition. • Erected scaffolds and platforms should be inspected continuously by those using them. • Exercise caution when entering or leaving a work platform. • Do not overload scaffolds. Follow manufacturer's safe working load recommendations. • Do not jump onto planks or platforms. • Do not use ladders or makeshift devices to increase the working height of a scaffold. Do not plank guardrails to increase the height of a scaffold. • Climb in access areas only, and use both hands. • Where required, use proper personal fall arrest equipment, and use it properly. • Use all equipment and all devices in accordance with the manufacturer's instructions. • Do not overload, modify, or substitute equipment. • Before commencing work operations, preload wire rope and equipment with the maximum working load, then retighten wire rope clips and recheck rigging to manufacturer's recommendations. • Inspect all rigging equipment and suspended scaffold systems daily. • Inspect wire rope during each ascent or descent for damage. • Use care to prevent damage to equipment by corrosive or other damaging substances. • Clean and service equipment regularly. • Always maintain at least four (4) wraps of wire rope on drum type hoists. • Do not join platforms unless the installation was designed for that purpose. • Move suspended scaffolds horizontally only when they are not occupied. • When rigging for another drop, ensure sufficient wire rope is available before moving the suspended scaffold system horizontally. OSHA estimates as many as 50 lives can be saved and 4,500 accidents prevented annually if construction sites are compliant with current safety standards. • electrocution, principally due to proximity of the scaffold to overhead power lines. In 2004, general falls, including falls from scaffolding, ladders, and other places, accounted for 36 percent of all construction-related fatalities. Proper selection, use, and installation of guardrails, personal fall arrest systems, and fall prevention systems is essential to prevent falls and to prevent deaths and serious injuries due to falls. Select equipment that meets current standards. Install it properly as directed by the manufacturer. Use it as it is intended to be used. Again, education is the key. A properly selected personal fall arrest system that meets all current standards does no good if it is not used by employees. Collapse of a scaffold is usually due to overloading, improper assembly, or faulty parts. Scaffolds are highly engineered products. They have been designed to support a specified load when erected in a specified configuration. Carefully follow the manufacturer's instructions regarding loading. Consider the weight of workers and materials, and consider buildings or structures that may be used to support the scaffold. Any part of a building or structure used to support the scaffold must be capable of supporting the maximum intended load. Overturning or tipping of scaffolds occurs when they are not properly tied or guyed. Ties must be installed when the scaffold height (measured to the uppermost platform) exceeds four (4) times the smallest base dimension. Some state or local codes require ties at three (3) times the smallest base dimension. Cantilevered platforms used to bring material up to the work platform, such as side brackets and hoist arms, can cause overturning and may require the scaffold to be tied at lower heights. Adding an enclosure on a scaffold, even an open mesh, also can overturn a scaffold due to an increase in wind loading. Additional ties or guys will be required. Check with an engineer to determine the location and spacing of ties for enclosed scaffolds. Proper assembly is essential. Proper assembly begins with a site survey. Before erecting a scaffold, a competent person should survey the site for hazards, such as untapped earth fills, ditches, debris, unguarded openings, and other hazardous conditions that may lead to instability. Scaffolds must be properly assembled with the scaffold base set on base plates and an adequate sill or pad to prevent slipping or sinking. Adjusting screws or other approved methods should be used to adjust to uneven grade conditions. Follow the manufacturer's recommendations regarding bracing and tying. Do not mix scaffold components manufactured by different manufacturers. Do not remove a scaffold component without proper authorization. Deaths have occurred from unauthorized removal of scaffold components, which may lead to instability or non-functioning safety equipment. For example, a worker on a later shift will not know that a guardrail or brace has been removed for better access to a particular activity. And do not alter scaffold components or use them for purposes for which they were not designed. To prevent overturning or collapse of rolling scaffolds, do not ride the scaffold. Wheels or casters must be locked to prevent caster rotation and scaffold movement when the scaffold is in use, and the top platform height as measured from the rolling surface of a rolling scaffold must not exceed four (4) times the smallest base dimension. The first step in preventing collapse of a scaffold is proper selection. Use scaffolds that have been tested to the ANSI/SSFI SC 100 standard for testing and rating of scaffolds. This standard was developed by the members of the Scaffolding, Shoring, and Forming Institute (SSFI) to provide a means of evaluating scaffolds and components. For suspended scaffolds, make sure that the hoist complies with ANSI/UL 1323 and has been tested and listed by a national lab, such as UL or ETL. Rigging devices, such as parapet clamps, cornice hooks, and outrigger beams, should be tested to the ANSI/SSFI SPS 1.1 standard. To avoid injuries caused by falling tools, work materials, or debris, equip scaffolds with toeboards or equivalent devices as required by code. According to the ANSI/ASSE A10.8 standard, "Toeboards shall be required with guardrail systems on all open sides and ends of scaffolds at locations where persons are required to work or pass under the scaffold." In addition, the A10.8 standard states: "When materials are piled higher than the toeboard and in areas where persons are required to work or pass under the scaffolds, the scaffolds shall be provided with a safety screen or the equivalent of sufficient strength to prevent falling object hazards and located between the toeboard and the toprail extending along the entire opening." Secure or remove all materials from rolling scaffolds before moving the scaffolds. Scaffolds should never be used or erected near electrical power lines without consulting a knowledgeable qualified person. Take care when using power tools or temporary electrical wiring, and obtain proper training before engaging in such activity. Scaffold accidents and injuries aren't inevitable, but instead are preventable. Training, education, and proper selection and use of equipment will greatly reduce scaffold accidents. 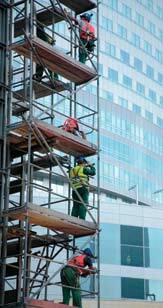 Use resources such as SSFI to learn about standards for scaffolds and tips on proper selection and use of equipment. Relevant information from SSFI, OSHA, and other organizations can be accessed easily through the SSFI Web site.